Today room 11 and 12 were lining up to play athletes. Before we got started we had to talk to Miss King about what kinds of things we were going to play. The first thing she said was, ‘‘ There is a moon hopper that is like a cushion filled with air, hurdles that you can jump over and you will see all the different kind of things to play with’’. Then we got started and the first thing room 11 did was the relay. The first relay was throwing the equipment. We all had a turn. When I had a turn I saw a lot of equipment. There was a sock ball,tennis ball,heavy ball that weighs a lot and last but not least a funny little sack. I picked the heavy ball and it soared through the air. I never knew it would go that far. Boom!!! The bell went which was the sign for us to move on to the next activity. Our next activity was basketball. I was so excited. We had to get into teams. As soon as it was my turn I got it in and we kept on going until the bell rang. I saw Amelia and she is good at shooting but then when she had a shot it got stuck into the corner. It looked like a small little pig that was screaming help!!! It was very fun today because I got to learn about what it was like if you help each other and encourage everyone you know. 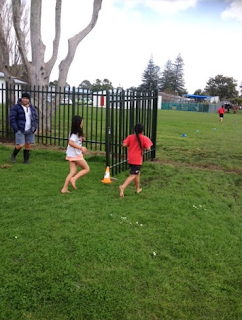 My favourite part of the day was when we got to do the sack race because I coorporated and encouraged my friends. I felt extremely happy because now I know If you're in a team you can have fun if you work together. On a cold shivering day room 11 and 12 played a game called Non- stop cricket. Then we finally started so I sprinted into my places. As soon as we started I hit the ball furiously. I was so happy that my cheeks was about to pop because Miss Squires said ’’ Rm 11 is batting and Rm 12 is fielding ‘‘which made me happy because my favourite thing about cricket is batting. With excitement I hit the ball as hard as I could then it went all the way to Nytram he caught it and put on the cone. When we were done batting it was time to field. When I finished my turn batting we also had a turn to field. I was trying to catch the ball but it flew across my head. Then suddenly Ayla hit the ball with excitement so I caught it and sprinted towards the cone and put it down. As went back to class we just noticed that we were warm because we were being active while we were playing . My favourite part of the day was when I hit the ball and it flew all the way to Nytram. And that is what Non- stop cricket is like when you give it a go.